AirPlay is one of the cooler features of iOS 4.2 that lets you stream video and music from your Mac or iOS hardware to an Apple TV or AirPlay speakers. 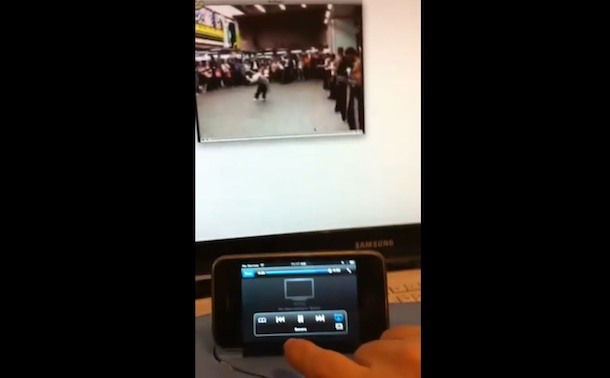 But wouldn’t it be nice if you could stream AirPlay video from your iPhone or iPad to your Mac? Now you can, thanks to a really cool hack from Erica Sadun of TUAW. Getting it to work is very easy, you simply download and launch AirPlayer onto the Mac you want to stream video to, and then when you go to AirPlay from your iPhone, iPod touch, or iPad, you’ll find your Mac on the list of screens to export it to. It does this by setting up a Bonjour service on the Mac that pretends to be an AppleTV so that your iOS hardware can see it. This would be particularly fun to use on a Mac Mini media center if you have one. No jailbreak is required but you will need iOS 4.2 and a Mac with Bonjour enabled, it’s free to download so if you want to try this out, you can download it from EricaSadun.com (current version 0.28). Random rant here: don’t you wish the iPhone didn’t record with that screwy vertical resolution? Outside of iOS devices, it doesn’t look right. Anyway, this is an awesome hack, so much thanks to TUAW for bringing this to light. yes, i do wish, that is the dumbest feature of iOS EVER, and it bugs me even more when folks who are obviously tech savvy record video in portrait mode. LOL I agree, she’s smart enough to create this software but she can’t rotate the freakin recorder into landscape?? Is this really a hack? Because I don’t want to damage a $1000 Mac. It just causes your Mac to behave as an AppleTV so the app receives AirPlay streams, your iPhone doesn’t know the difference. Works for me, but why are there ads in the app?